Osprey is a publishing company based in the UK. Proclaiming its independence from Czech territory in March 1939, the Slovakian government soon signed a protection agreement with the German Reich. The small nation later became Hitler’s only ally to join the attack on Poland on 1 September 1939 – it was also involved in the invasion of the Soviet Union right from the start. Equipped with obsolete B-534 biplanes, the Slovaks still managed to shoot down a number of communist aircraft while defending their ground forces. Issued with battle-weary Bf-109Es in October 1942 and flying as 13(slow).JG 52, the Slovaks soon showed their fighting prowess. Given Bf-109F/Gs in early 1943, the staffel claimed 215 kills up until it was pulled out of the front line in September 1943 and given the task of defending the homeland. Unlike Slovakia, Bulgaria never declared war on the USSR, although it supported German efforts in Yugoslavia and Greece. First seeing action in August 1943 during the American raids on the Ploesti oilfields in neighboring Romania, Bulgarian fighter pilots used their Bf-109Gs to good effect. The Osprey Aircraft of the Aces Series gives comprehensive histories of the elite fighter pilots of various nations and the aircraft that they flew. The books are a unique source of information researched by recognized experts, and brought to life by firsthand accounts fr9om the combat veterans themselves. The books are concise, with authoritative text supported by at least 30 specially commissioned original color artworks, new scale plans and the best archival photography from around the world. This book is soft-cover and contains 96 pages in 8” x 11” page format. There are 63 black and white wartime photos of aircraft and 51 more black and white photos of the pilots that flew them. “On the morning of 28 November 1942, members of 13(slow)./JG 52 encountered Soviet fighters for the first time. During a freie Jagd near Tuapse, in the Caucasus, two Slovak Bf-109E-7s, piloted by porucik (second lieutenant) Vladimir Krisko and catnik (sergeant) Jozef Jancovic, met nine Soviet Polikarpov I-153 Chiaka biplanes. After a short fight, three kills were claimed by the Slovaks, the first by Krisko in Bf-109E-7, WK-Nr 6474, white 12 and the other two by Jancovic. However, due to the rigorous German checking procedure, none of these kills was officially confirmed. At the back of the booki is a 4 page appendices and the captions for the color profiles on 4 more pages, followed by the bibliography and index. Other Aircraft of the Aces books by Osprey are for Italy, Bf-109 Aces on the Russian Front, Tomahawk and Kittyhawk Aces of the RAF, P-40 warhawk Aces of the MT, Croation Aces. 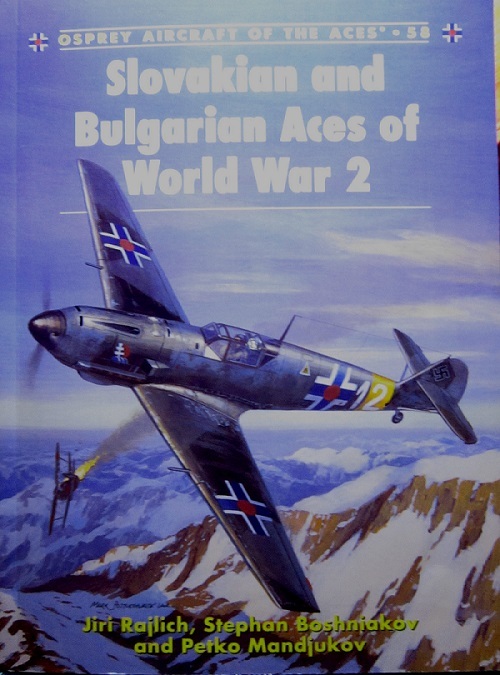 Hungarian Aces, Rumanian Aces, LaGG & Lavochkin Aces, Royal Navy Aces, vol. 2 of Bf-109 Aces on the Russian Front, American Spitfire Aces, Griffon Spitfire Aces, Malta Spitfire Aces, American nightfighter Aces and Spitfire Aces of Burma and the Pacific. I have a number of these titles in my library and they are all excellent. Highly recommended. I got the Slovak one at the gift shop in the National Slovak Museum in nearby Cedar Rapids, IA. It has a copyright date of 2004.